Being a new mom, I’m terrified of many things, mostly of things I can’t control. That’s why when it comes to things that I CAN control, I’m taking extra care to be sure I give my son the very best. This leads me to a discussion on diaper rash. 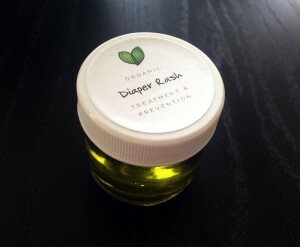 Prior to our baby’s birth, I researched all I could on remedies to prevent and—if necessary—treat diaper rash. Here’s what I’ve done so far. Please note that I am by no means an expert—I’ve only been a mom for 4 weeks. But so far, this is working for our baby! UPDATE: Our little one is 11 months now, and this process/products below are still our GOLD standard in diaper rash prevention/treatment! Most importantly, change the diaper regularly. We are currently using Earth’s Best Diapers. (Update 8/2014: We switched to Honest diapers during the day, and cloth overnight). As soon as the diaper is wet, be sure to change it. There’s nothing bacteria like more than a warm, wet environment! Also, use all-natural laundry detergent, natural diapers and natural wipes to avoid allergic reactions. 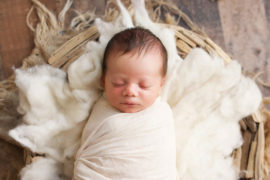 Organic clothing on newborns is also helpful. Wipe down baby with Earth’s Best Wipes. This removes stool and urine that can contain substances like bacteria, yeast, parasites and other toxins that can cause diaper rash. Wipe down baby with water using a wet washcloth (we’re currently using GroVia wipes). Pat dry with a dry washcloth. From this point, I’ve been alternating treatments. I alternate between just putting him in a diaper, with no special “treatments”, using an Organic Coconut/Arrowroot Powder mix and using an Organic Oil Treatment. The Organic Oil Treatment should only be used every 3 diaper changes (or 2-3x a day), and the Powder Treatment should be used whenever you feel necessary, especially when there is moisture present. First and foremost, this powder does NOT contain talc, which is a common carcinogen and has been proven dangerous to a child’s lungs. I apply it by shaking a small amount into the diaper, then spreading it across the diaper with clean hands. I apply the powder to the diaper away from my baby’s face so that he does not inhale any of the powder. The ingredients in the powder have anti-microbial properties and help absorb moisture. You can easily make your own powder mix at home, or you can purchase it online. Check Amazon for cheaper prices. If baby experiences a reaction, discontinue use. The oils moisturize baby’s skin as well as protect and disinfect without disrupting the skin’s natural protective properties. I have used this since my son was born for diaper rash prevention AND treatment! Buy online from my Etsy shop! To help neutralize acidity of diarrhea/diaper rash on baby’s skin, pour baking soda in a warm bath and have baby soak in it. Works wonders!